With a small in-dash dongle and flashy app, Automatic wants to quantify the time you spend behind the wheel of your car. By providing you with information about your driving style and linking to other apps, Automatic hopes you’ll want to make its service part of your daily routine. The real question is why you’d want to make Automatic part of your life. Do you really want to know how many times you pump the brakes too hard, or speed up to get around someone? Does it actually matter how many minutes you spent driving over 70 miles per hour? 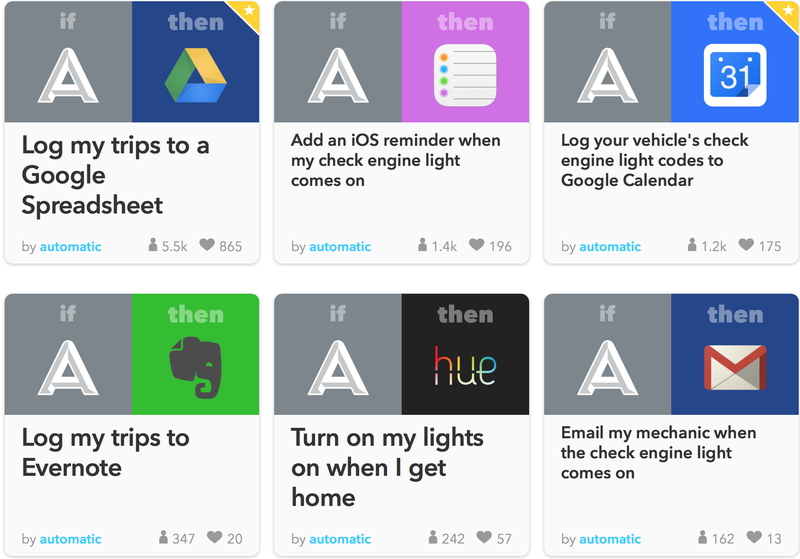 Automatic tries to succeed where others in the “Internet of Things” realm often fail: context. Making info make sense to you is the real lynchpin for success with any (or all) of your connected gadgets. Aside from your smartphone (both iOS and Android are supported), Automatic has proprietary hardware you’ll need to pick up. 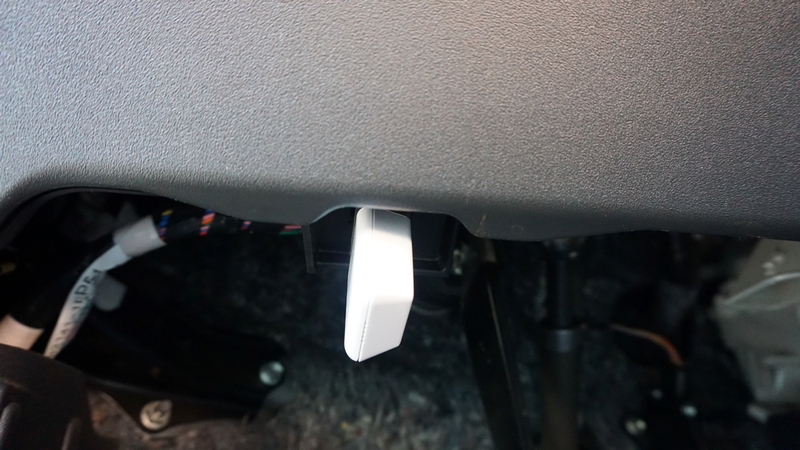 The small dongle slides neatly into the OBD port in your car, often found somewhere underneath the dash. There isn’t much to the hardware itself. 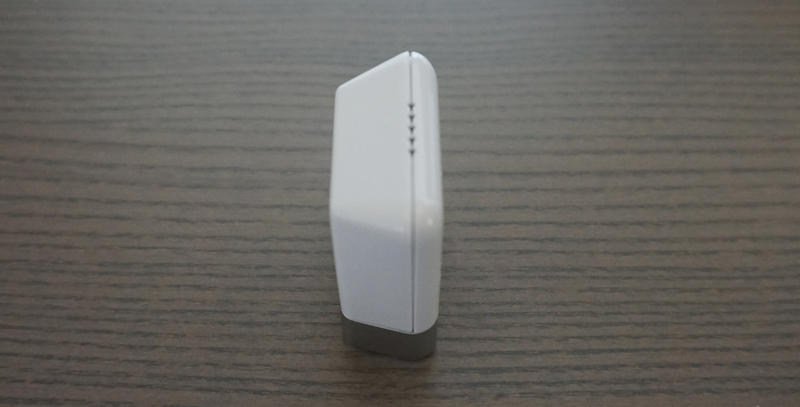 It’s small and white, little more than a Bluetooth beacon that can access your car’s computer. Internally, there are plenty of components there to read the info your car shares with the sensor. Your lone reminder Automatic is still there comes from a tiny speaker that emits beeps as you drive. Many might be content to plug their dongle in and open the app, then hope for the best. If Automatic is being asked to explain things about your drive or car to you, it’s worth some background on how it gets that info. Your car has a code, which is what Automatic’s hardware reads via the OBD port. Some auto manufacturers charge for access to the information those codes have, depending on your vehicle. Auto manufacturers may charge big money, too, so your little dongle is only as good as what it can read. Typically, any OBD reader can provide basic info. If your check engine light came on because your gas cap wasn’t on tight, a simple reader may be able to tell you. Other detailed info may not be readable by anyone other than a mechanic with an expensive machine. Your mileage will ostensibly vary. While you won’t be dealing with Automatic’s hardware much, the app will be something you see often. The main screen shows a timeline of your drives, and some ongoing stats up top. You’ll see your drive score for the week, as well as how much you’ve driven. 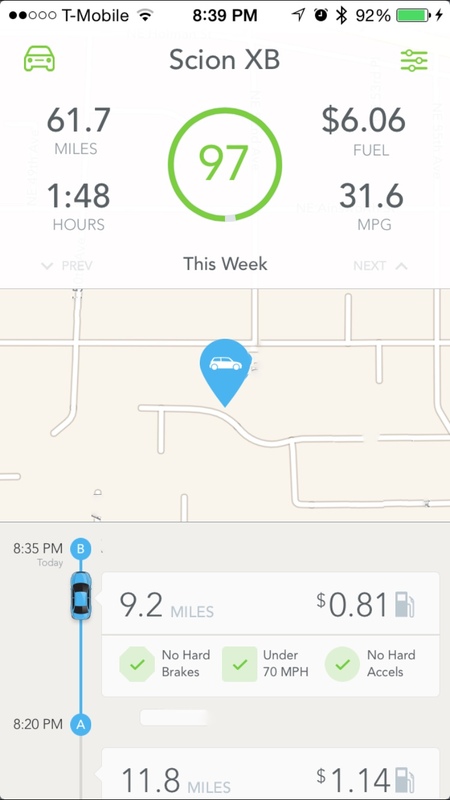 Automatic can even tell you how much you’ve spent on gas, both total and for each trip. When you conclude a trip, Automatic notes your end point and saves it to help you remember where you’ve parked. 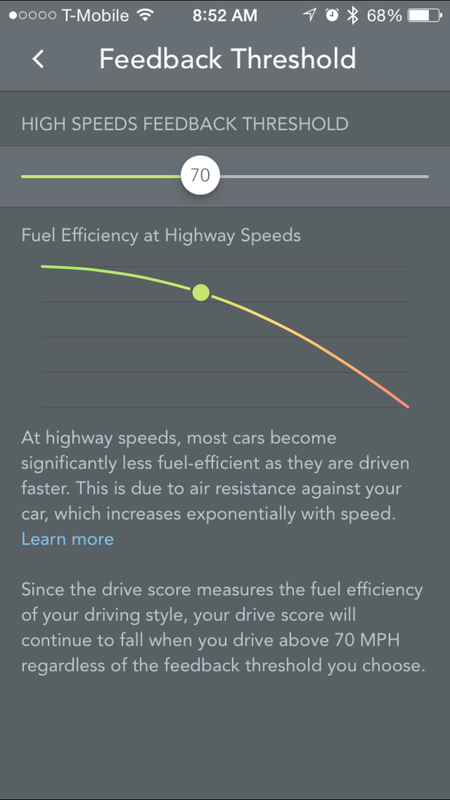 Trip previews also show you stats like how often you brake or accelerate to harshly, and how much time you spent driving over 70 miles per hour. The miles per hour metric may seem arbitrary, but Automatic has a clever graph detailing your expected gas expenditure depending on your speed. At 70 miles per hour, your miles per gallon ratio starts going south quickly, according to Automatic. Tapping on a trip will bring up stats for the journey. You’ll see your miles per gallon, drive time, miles travelled, and cost of gas for that specific journey. A map shows you the route taken, and even where you hit the brakes or gas too hard. You’ll also see where you were when you crested 70 miles per hour. A slide-out menu lets you toggle features like when you’d like to receive audible notifications, and lets you cobble trips with less than 15 minutes between them together. There’s also a crash alert option, which notifies the authorities as well as a select group of contacts if you’ve been in a serious accident. A secondary menu on the other side of the screen tells you if your car has issues that need addressing, and suggests mechanics in your area sourced via Yelp. In testing both for a few weeks — including a long trip to San Francisco for WWDC — I found some positive points for Automatic. There are, unfortunately, also some annoyances. Starting a drive, you’ll get a quick audible alert that the device and phone are linked. Unless you violate the three main tenets of Automatic — hard braking, quick acceleration, or too much time driving over 70 miles per hour — you won’t hear anything else. Those audible cues can be disabled on the settings menu if you just want Automatic to shut up and let you drive, which is a good idea if you’re easily distracted. A few beeps may leave you daydreaming about what you just did wrong — Automatic’s audible cues are never positive. Automatic is simple. You get granular info about your trips, but that’s about it. 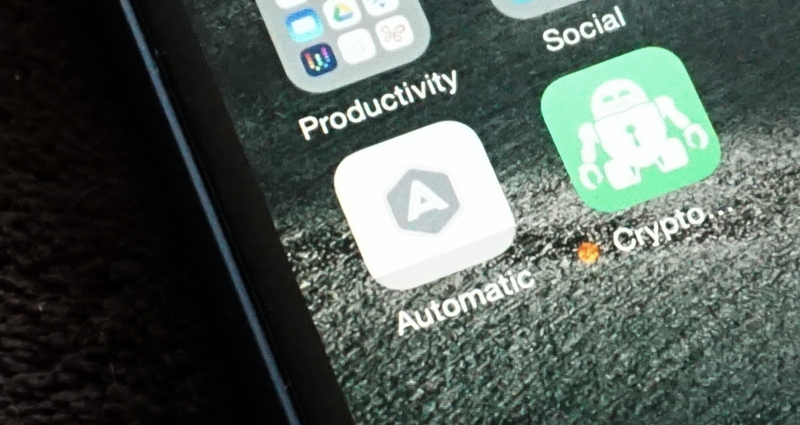 From there, Automatic lets other apps that link to its service do the heavy lifting. You can use IFTTT for all kinds of redirection of information, but most of the other available apps relate to trip expensing. Automatic’s business trip tagging feature is limited; you can tag trips, but there’s no breakout view for those business trips. It’s hard to imagine why the feature exists if there’s no separate view specific to tagged trips. You can also link to Nest to pre-heat or cool your home as you get closer. Linking Automatic with Jawbone provides a look at how driving may be affecting your health. Your parking location can be found on your wrist by linking to the Pebble app, and Automatic provides the same info with an Apple Watch glance. Automatic’s drain on the phone is noticeable. During heavier use, it drew up to 16 percent of my phone’s battery. Over time, Automatic pulled about 5 percent — but I don’t drive much. 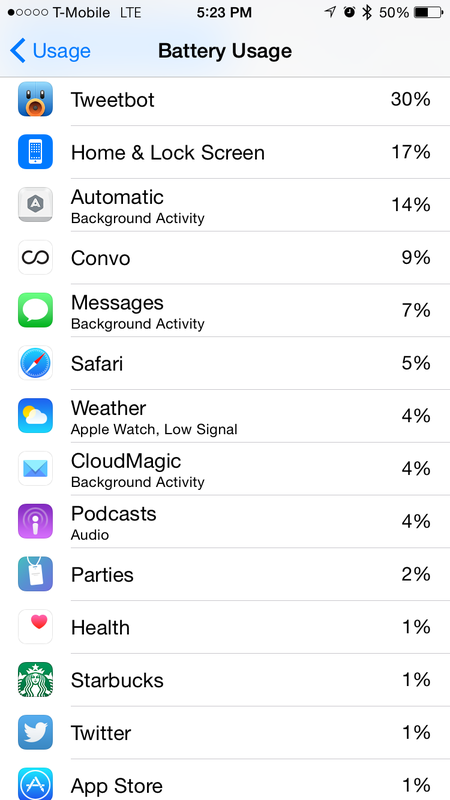 I’d wager someone who was commuting daily might see a bit more battery drain than I did. With iOS, you’ll need to have the Automatic app running in the background. 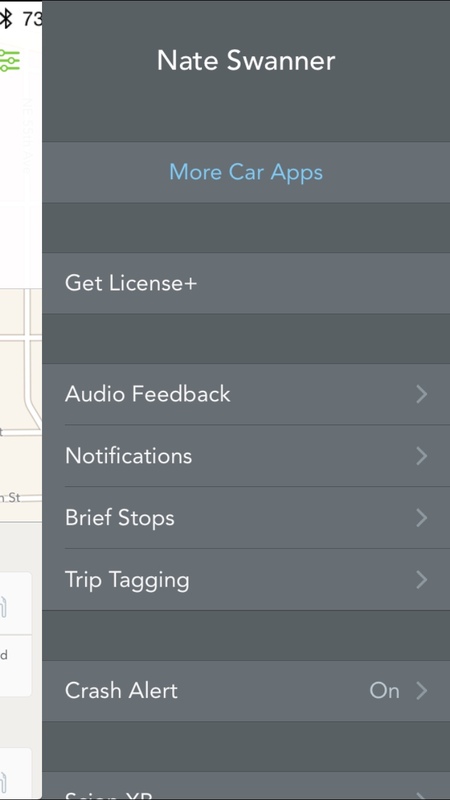 If you can remember to open the app each time you jump behind the wheel, there are no problems. Otherwise, you may miss logging some of your drive data. Perhaps most agitating was Automatic’s inability to notice I was using cruise control. If my car accelerated quickly or broke too hard on its own, it affected my drive score. Automatic is handy. I never encountered as much myself, but I do like that you may get some details on what that check engine light means via the app. The collision reporting feature is a smart safety feature and — though the selection is a bit clumsy right now — allowing other apps to link to Automatic expands its reach. Those who use their own vehicle for business purposes will also like the ability to tag trips for business, and you can choose to have the app prompt you to tag trips at the end of a journey if you like. The downside is that the Automatic app has no breakout view for business trips. 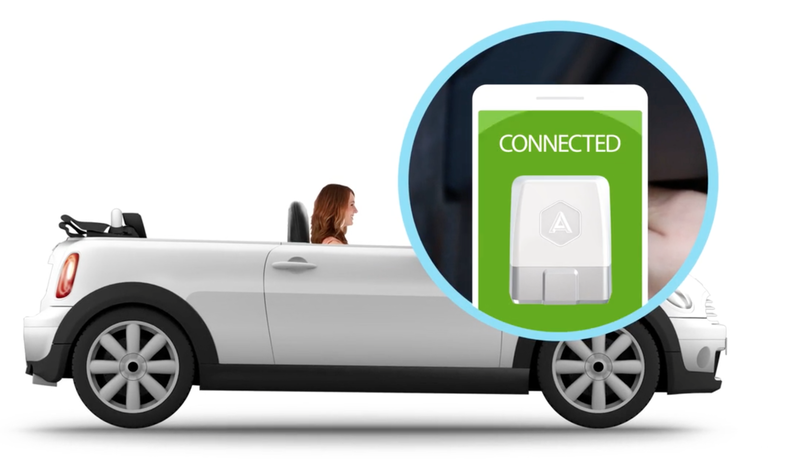 As a standalone service, Automatic is the brains to your car’s brawn — and that’s precisely why you’d want it. Context is important, and Automatic delivers. You’ll not only know what Automatic thinks you’ve been doing wrong, but your drive score reflects it. If you brake too hard, too often — your score drops. Jump off the line at red lights and you’ll get knocked. Drive too fast for a long period of time and Automatic will reflect it in your drive score. Avoiding accidents is obviously paramount when you’re behind the wheel, but Automatic may make you a better driver by keeping tabs on your behavior. Add in vehicle diagnostics and third party apps and Automatic really shines.